Did you ever wake up from your peaceful sleep because of the sudden abominable noise coming from your neighbor’s house/apartment? Have you ever tried to take a nap, or enjoy some peace and quiet after a long day at work, with a cup of tea and a book in hand, only to be thwarted by the banshee-like wail of your leaf blower? If that is the case, then, my audio-tormented brothers and sisters, I feel your pain. But why should you suffer under the yoke of your noisy neighbors? It is time for some well-deserved retribution, and in this text, we will offer you some creative yet harmless ideas to do so. It’s time for the Empire to strike back! Not all neighbors are bad though. Some you can easily reason with. Type 1 neighbors are neighbors who are really forthcoming when it comes to noise. They follow the rules, they are usually quiet, and that one time you heard some din coming from their house/apartment was purely by accident – they were simply unaware you can hear them. Those neighbors are the best – all it takes is one conversation, and all is well. 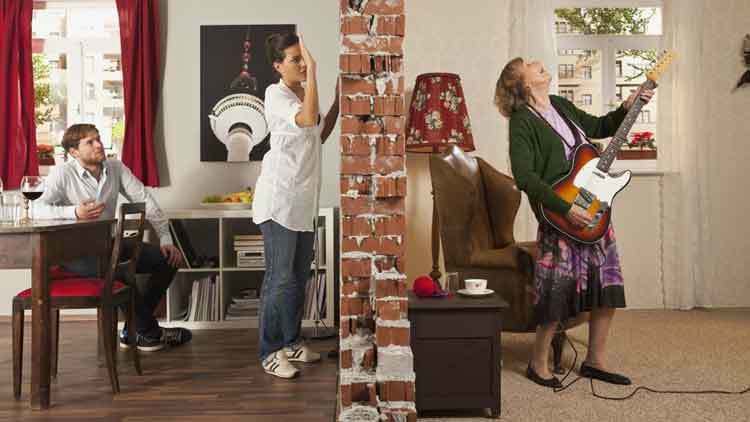 Type 2 neighbors are loud, but they usually can’t help it. You being able to hear them is often not their fault, but the paper-thin walls separating you and your apartment. In those moments, you just have to make due. Type 3 neighbors… Oh, the Type 3 neighbors. They are the proverbial neighbors from hell. However much you ask them to turn the volume of their TV down or to stop blasting dubstep at 4 AM, or stop drilling their walls at 7 AM, it simply has no effect. In fact, it somehow makes things worse! Well, no more! The day of reckoning has come. Make sure you get up earlier than them and start doing your outside chores making as much noise as humanly possible. Mow the yard, or blow the leaves, and spend as much time on it as you can. Our recommendation: Husqvarna 125B. Your neighbors love blasting their favorite music in the middle of the night? Fight fire with fire, and do the same to them! Casually talk to them one day, ask them about their audio system, buy a stronger one, and then, when they least expect it, show them the meaning of loud! Choose your musical weapon carefully – if they play techno or dubstep, blast them back with Metallica. And justice for all! For the highest possible sound quality, consider getting this little monster. This is an entirely new level of musical vengeance. For this you don’t need to buy a stronger music system than that of your neighbors – you can stream your music through their speakers! A certain tech geek who goes under the pseudonym of Junkyardmessiah concocted this glorious do-it-yourself plan to get even with his annoying neighbors, originally posting his method on Reddit. You can find it here. Bear in mind, however, that this option may not actually be the cheapest of them all. This one’s a tad risky because people react to snakes differently, and this may cause some serious health problems for your unsuspecting neighbor, so consider it carefully. The idea is to buy some plastic or rubber snakes, put them in your neighbor’s garden, then place a hidden camera somewhere where it would be able to catch a good shot of your terrified neighbor. You will get a nice funny video, and your neighbors will finally mow their unkempt, wild grass. Bonus points if you post the video on YouTube. Remember how you always say you wanted to start doing sports again but somehow always find an excuse not to? Well now is the time! Install a basketball hoop in your front yard or driveway, and start playing your favorite sport. Even if your play time is just before dawn. And try hitting the board as much as possible for extra noise. This way, your neighbors get punished, and you start living a more active and healthy life. It’s a win-win situation. For you. If you have a dog, it’s always good to provide him with as much space as possible. Make a nice little house for your pet, put in as close to the fence dividing yours and your neighbor’s property, and let him live the dream of freely roaming around and barking at any time of the day. And especially, the night. And don’t forget to properly feed and take care of your pet! Revenge is sweet, but your dog is much sweeter! Another music-related way to get revenge is with music lessons. If you ever dreamed about learning to play an instrument, for example, a violin, use that to your advantage. Dust off the violin you inherited from your musically gifted grandparent, and begin practicing, preferably in the most inappropriate times of the day. Choose your timing carefully for optimal results, and don’t forget to keep your windows open to maximize the effect! Option 2 would be to finally indulge your child and allow them those drumming lessons they want so much. This drum set might help. Since Christmas and New Year’s Eve are getting near, it’s the perfect time to be a good neighbor and decorate your annoyingly loud neighbors’ tree. Not their Christmas tree – their normal tree. And not with Christmas decoration, but with toilet paper. This method may be a bit childish and quite immature, but it will certainly achieve the intended effect. It would be nice to write some nice New Year wishes on the paper for your neighbors to read. A nice, although unorthodox way to show them that you care. Paint the side of your house closest to your neighbor in some strange colors. Use fluorescent colors to creep your neighbors out, and when they ask you why just tell them how much you love plants and animals that have this very specific trait. When every viable option fails, no matter how rational or silly it may be, just call the police and let them handle it. They are best suited for these situations, especially if your neighbors tend to get aggressive when someone tries to talk some sense into them. Now that you have all these clever, devious, and efficient ways to get revenge, think carefully about your situation and the type of your neighbor, see what would work best, and act accordingly. Bear in mind, however, that some of these ideas might do you more harm than good, so the wisest thing you can do is to call the police. If even that fails, take justice into your own hands and smite the annoying neighbor with full the force of your righteous wrath. And if by any chance you are the noisy neighbor, please, kindly tone it down. Karma is not to be messed with, and neither are your peace-and-quiet-loving neighbors.